Advanced business card maker software is useful to design and generate different type of standard size or customized business cards in easy way. Technically advanced and easy to operate card maker software provides facility to create premium quality business cards with option to add photo, barcode, text, icon during business card/visiting card designing process. Affordable business cards maker program with use of business card design provides facility to generate your own business cards in simplified way. Business card maker program design and create business cards using image designing tools including Line, Ellipse, Pencil, Rectangle, Text, Barcode, Picture, Arc, Triangle and Star objects. Business card software provides option to create business cards with specific type of fold including Quarter Fold, Half Fold etc. 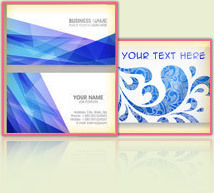 Business cards program provide option to add WordArt text-styling feature to the business card. Option to create business card using wizard or with blank format. Design and create business card in Rectangle, Rounded Rectangle, Ellipse or CD/DVD label shape. Option to specify the color and background settings of business card including Solid Color, Gradient, Image and Style settings. 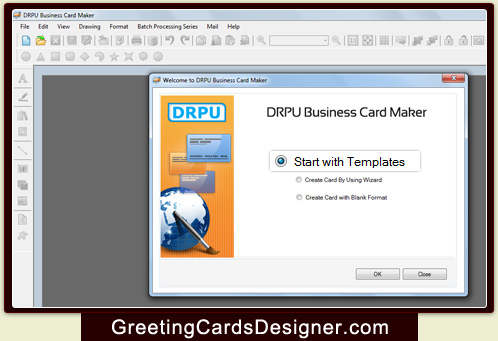 Option to include message using message templates during business card designing process. Data Set Series feature allows to generate the multiple copies of business cards with different barcode and text value.